Disclaimer: I was sent a Rep Fitness kettlebell in exchange for a fair review. All opinions expressed are my own. The kettlebell has long been one of my favorite strength training tools. It’s versatile, fun, and provides an effective strength workout. When I’ve included kettlebells in my strength training program, I notice that I feel stronger when running hills or fast workouts. Should you include kettlebells in your training? 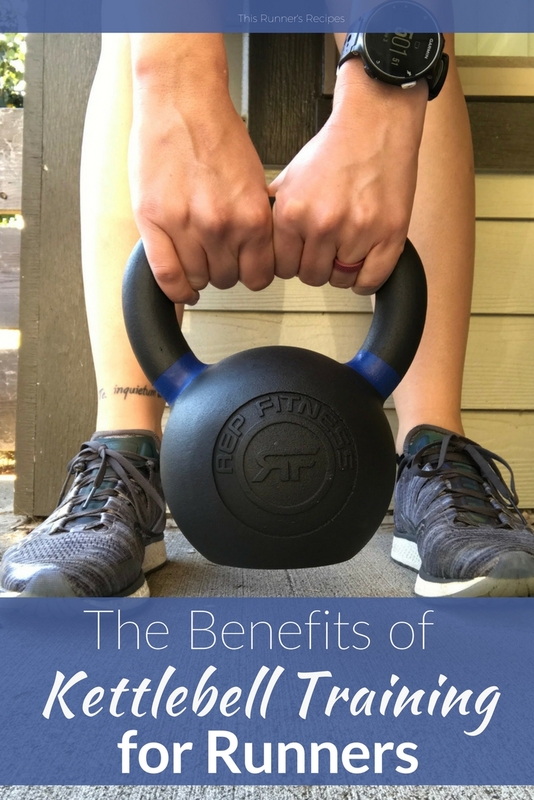 In this post, I want to examine the benefits of kettlebells for runners, review a kettlebell I recently tried, and share some of my favorite kettlebell workouts. Kettlebells are an effective tool for strength and conditioning. This simple piece of equipment can develop muscular endurance, strength, power, and cardiovascular capacity – all of which contribute to making you a better runner. Kettlebells differ from dumbbells because of their unique shape and size. A kettlebell loads differently than a dumbbell and you have to work harder to balance the weight. Personally, I prefer the shape of the kettlebell for loading exercises such as single leg deadlifts or lunges – the bell shape feels more comfortable yet also more challenging. A 2015 study in the Journal of Strength and Conditioning found that female athletes who completed a 4-week kettlebell strength training program experienced an average VO2max improvement of 6%. Your VO2max is one of the factors that affect how fast you run – meaning that kettlebell training could help you run faster. Kettlebells are often used in explosive movements, such as the kettlebell swing. These explosive movements can help improve your running by improving your power, strength, and even running form. 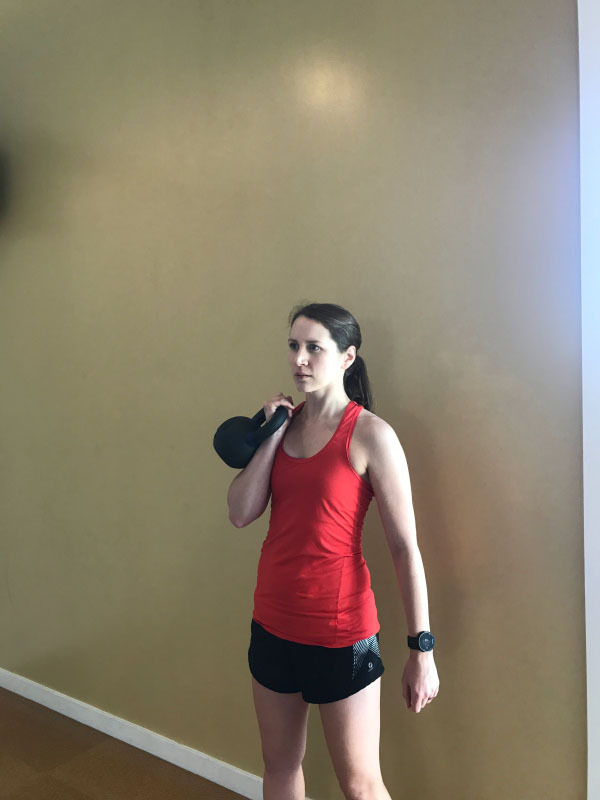 For example, the kettlebell swing develops power in your hips and glutes – power which you can use when running, especially when running fast or on hilly terrain. The kettlebell swing also strengthens the posterior chain, which in turn improves your running form. The unique shape of the kettlebell requires you to work harder to stabilize the weight, thus improving your stability. The stability training will also improve core strength. Many kettlebell exercises unilaterally strengthen the body – such as lunges and single leg deadlifts – which can decrease the risk of injury due to muscle imbalance. One benefit of kettlebells for runners is the efficiency. I can do a well-rounded strength training session that targets all the major muscles in just 15 minutes using the kettlebell. When training for a long distance race, I don’t exactly want to spend hours strength training – nor do I have the energy. A quick routine of kettlebell swings, single leg deadlifts, lunges, and shoulder press provides an effective strength workout in a short amount of time – and possibly even from the comfort of one’s own home gym. 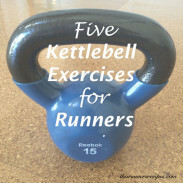 A kettlebell workout cannot replace your runs, particularly if you are training for a race. Nor is the kettlebell a magic bullet that offers exceptional gains beyond what any other strength training can. If you prefer dumbbells or barbells over the kettlebell, then you should stick with those. But what a kettlebell does offer is a way to incorporate power-building exercises into your routine, especially when you do not have access to barbell weights. Rep Fitness, a Denver-based company specializing in home gym equipment, sent me a 12 kg (26 pound) kettlebell to review. Price: Kettlebells can be expensive! The options available on Rep Fitness’ website are affordable without sacrificing quality. (The 26 lb. kettlebell costs $30 USD plus shipping). Aesthetic: My other kettlebell has chipping paint. The finish on these is smooth and durable – there’s no cheap paint to chip. Grip: The matte black coating does not slip in sweaty hands, but it also is smooth enough that my hands aren’t torn up after a strength training session. I did not feel nervous about wielding this bell and I even found it more comfortable to hold in a rack position than other kettlebells. Quality: Rep Fitness kettlebells are cast using a single-cast gravity method, which translates to high quality. The weight is completely flat on the bottom, easy to grip, and very well made. Customer Service: The customer service people at Rep Fitness were friendly and very quick to respond to emails. I received my kettlebell just a few days after ordering and it was securely wrapped. 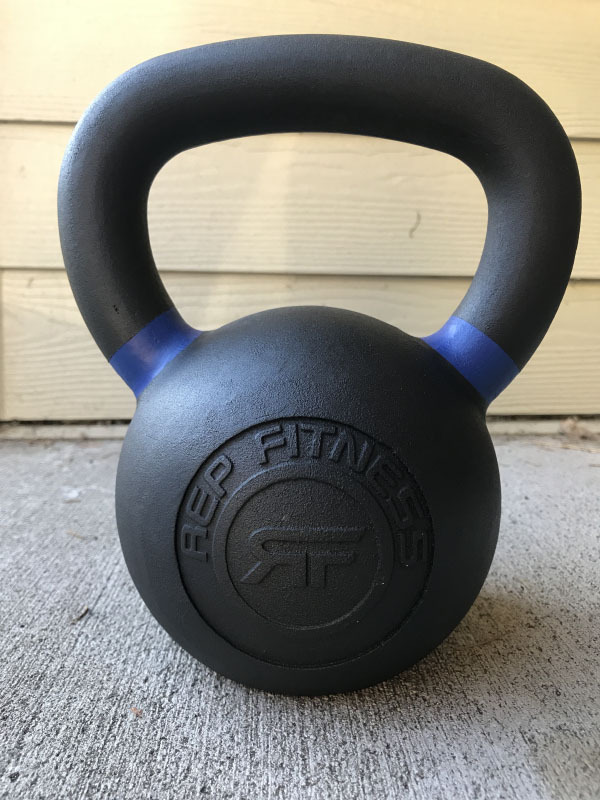 I am genuinely impressed with the quality, comfort, and durability of the Rep Fitness kettlebell and would purchase from them again. You can use the kettlebell to load basic movements: single leg deadlifts, lunges, squats, shoulder presses, rows, and more. In addition to using the kettlebell as you would a barbell or dumbbell, you can also perform specific movements such as kettlebell swings, halos, Turkish get-ups, and windmills. Always practice good form when using a kettlebell. If in doubt, consult a strength and conditioning coach or personal training for guidance or watch tutorials from certified trainers (such as this video on how to do a kettlebell swing). When doing kettlebell workouts, be sure the area is clear of any fragile objects, pets, or small children. Rep Fitness sells all types of home gym equipment, from slam balls and plyo boxes to battle ropes and barbells. You can view their selection on their website here: https://www.repfitness.com/. Do you use kettlebells in your training? I use kettlebells all the time in my strength training! I need heavier ones because the ones I have are 15 lbs. My gym has a nice range of options so I’ve been using up to 35 lbs when I go there. You should really try these – I was impressed by how affordable they were! Yes! I use KB’s in my training. 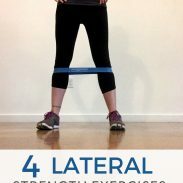 They are so versatile and are so much easier to use for functional exercises. My favorite lately has been KB plank rows. Talk about a core burner! KB plank rows are such a good exercise – a definite burner! I have been slacking on overall strength training with weights and my “strength” days have mostly been of the yoga variety where kettle bells are frowned upon 🙂 I used to LOVE working with KBs and I love how you really get into the WHY they are so great, specifically for runners. Good stuff, as usual! Thank you! I once saw a workout in Shape or Self or one of those magazines that attempted to combine yoga and kettlebells… but I don’t know if that was a good idea! I love the diversity of exercises that you can do with kettlebells–stability, strength, power… the possibilities are endless! They are so versatile! Dumbbells almost feel disappointing after using the kettlebell for long enough. I have a dumb question. How do you know the weight your KB should be? I’ve done KB exercises in the past, but never noticed much of a difference. However, mine is only 10 lbs – when I saw you were using one that was 26 lbs (!!) it made me wonder if that’s why I wasn’t seeing/feeling a benefit. Thanks for always putting out interesting material! Not a dumb question at all! I use 15 lbs for some moves and just worked up to 26 lbs for swings, squats, deadlifts. You want a weight that feels challenging to use for the number of reps (5-10) but not so heavy that you cannot perform the move with improper form. If you can do so with proper form, do not be afraid to lift a bit heavier. I experimented a lot to find what works – it’s different than dumbbells. I hope this helps! I did crossfit for a few weeks about 2 years ago and while I didn’t love it, I did really love using the kettlebells. I always felt super strong when using them! They are so effective for building strength – and the great thing about them is you can use them outside of CrossFit! (Which honestly, they always look like the best part of Crossfit when compared to the other lifts). 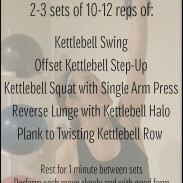 Kettlebells are a fun change of pace from the usual strength routine! I love the efficiency of kettlebells too! I try to incorporate them about once/week. I only have one 25 pound one, so I can’t use it for every move as it’s a bit too much weight for a few simple exercises but I do feel like it’s made me stronger! Even just a few kettlebell swings with that weight can build a lot of strength! I have one 10 lb. kettlebell but don’t use it very often. I like the idea of doing a kettlebell total-body workout while training for a half or full marathon. I should get a couple heavier kettlebells. Would be convenient for sure! It is so convenient – I do squats, s/l deadlifts, lunges, presses, and rows with mine, and that’s a total body workout in under 30 minutes! This post is a great resource! I have a 15-pound kettlebell that I seldom use…I’m gonna refer back to this to get me moving & grooving with it. Thanks! Thank you! I hope you enjoy using your kettlebell – they are so fun! If they have 2-5 lbs then I’m in. I’m very nervous about going too heavy and throwing out my wonky back, but I know they would help with that too! They have a 9lb one as their lightest. If back issues are a concern, I highly recommend watching some form videos from a certified trainer first. When done right, moves like swings and deadlifts can strengthen your back, but they can pose danger when done wrong. They are such a great tool! I’m going to be building up my home gym soon and a kettlebell is definitely on my list! They are a great addition to a home gym! I use kettlebells when I’m in the gym but I don’t have them at home. they make for a good workout! I definitely feel my muscles after using them! I actually almost bought some Rep Fitness kettlebells over the summer because I didn’t keep up my university gym membership. These seemed like they would be the best value of any I looked at – good to know they lived up to appearances! The grip is far superior to similarly priced kettlebells from Target or other places. I definitely recommend you get them!